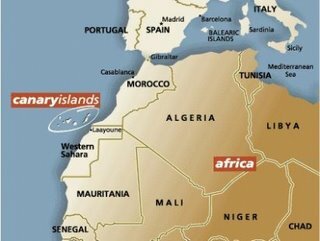 Mauritania, a country in West Africa far from Europe, has become the latest boundary for desperate would-be immigrants. They travel by boat for three days and nights to cover the 500 miles from Mauritania's long coastline to the Canary Islands, which is Spanish soil. Once in the Canaries, the whole of Europe lies before them. The voyage is perilous and over a thousand Africans have died during the past four months while sailing the Atlantic Ocean in traditional wooden fishing canoes called pirogues, normally used for net-fishing expeditions. The vessels are uncovered, are usually powered by a single outboard engine, and rarely carry navigational or emergency equipment. Up to 40 per cent of those who attempt the crossing from Mauritania may not make it. 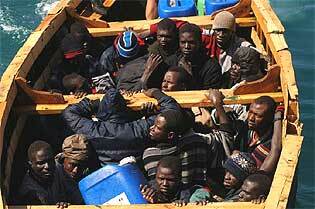 Still, 8,519 Africans reached the Canaries in 2004, 4,751 in 2005, and over 3,500 so far in 2006. The Spanish government has has detained at seamore than 1,000 migrants in the last 10 days alone. Mauritania, one of the world's poorest countries, is unable to handle the influx. Its prime minister, Sidi Mohamed Ould Boubacar said that the country. "can't control its borders and needs help against this massive wave of immigrants. We can't resist this growing pressure. We need help of all types: planes, boats, vehicles." He said the authorities arrested 3,900 migrants in 2005 and already 1,200 in the beginning of 2006. "What is arriving is unimaginable." The increase appears to result from the crackdown at Ceuta and Melilla. Unable to reach there, the Canaries became the destination of choice. "The smugglers have just moved the boats south because the Moroccan police and border patrols are now stronger," says Manuel Pombo, a Spanish ambassador-at-large. In humanitarian terms this migration is a human tragedy; for Europe its a horrific nightmare. For tens of thousands are pouring in to change the demographics and eventually change ancient European customs and mores to Eurabia and Sharia while exacting the jizya on the unfortunate non-Muslim survivors. Destruction of the West by immigration is the goal. Why are our leaders insisting upon this? I just do not understand. The greed disgusts me.